This is my one of my hankos that I use on my etegami. A hanko is a stamp or seal or chop. Another one I use simply has my first initial “ア” in the Japanese katakana syllabary (if you’re curious about what that is, here is a useful explanation). 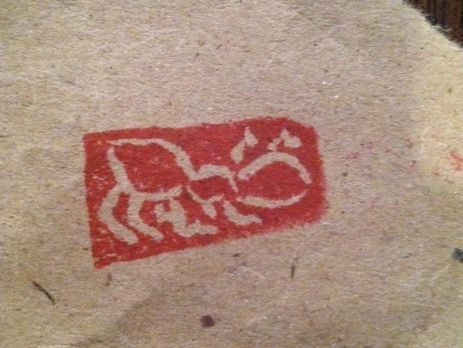 I made the ant hanko with an eraser and an exacto knife, per instructions in Dosankodebbie’s Etegami Notebook blog. I highly recommend that post, and all her posts, for a guide on getting started in etegami. Still, for etegami, an image of an ant works.